What a bright idea for a gift!? 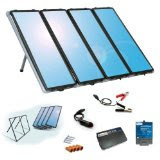 The Sunforce 50044 60-Watt Solar Charging Kit provides up to 60-Watts of clean, renewable power and is designed for RVs, cabins, homes, boats, back-up and remote power use, and more! The Sunforce 50044 60-Watt Solar Charging Kit includes four 15-Watt solar panels with durable mounting frames; a 200-Watt power inverter; a 7-Amp solar charge controller; and a wiring kit with accessories for easy installation. This solar charging kit can help keep your batteries charged, features a built-in ultra-bright blue LED charging indicator, and is a great choice as a gift idea for him.